Fig 1: a) Time series of the cumulated Greenland ice sheet (GrIS) Surface Mass Balance (SMB) in GT simulated by the regional climate model MAR (version 3.7) forced by the NCEP-NCARv1 reanalysis since 1 Sep 2011 (in green), and 1 Sep 2017 (in red). The 1981-2010 mean simulated by MARv3.7 forced by NCEP-NCARv1 is also plotted in black. b) Same as a) but for the daily SMB in GT/day. The absolute maximum/minimum SMB rate of each day is plotted in blue. c) Daily mean GrIS near-surface temperature (TAS) simulated by MAR. The absolute maximum temperature of each day is plotted in blue. d) Time series of the North Atlantic Oscillation (NAO) index from Climate Prediction Center (CPC). Fig 2a: Left) Cumulated SMB (in mm) from the 1 Sep 2015 to 31 Aug 2017. Right) Same as Left) but in respect to the 1981-2010 average from the 1 Sep to 31 Aug. The anomalies lower than the 1981-2010 interannual variability are hatched. Fig 2b: Same as Fig 2a but for snowfall. Fig 2c: Same as Fig 2a but for run-off. Fig 3: Time series of a) the daily mean GrIS Run-off (in GT/yr), b) production of meltwater (in GT/day), c) daily mean GrIS incomming long/shortwave radiation (in W/m²)), d) bare ice extent (i.e. area where the surface density is > 900 kg/m^3 in % of the ice sheet surface) and e) daily mean GrIS surface albedo simulated by MARv3.7 forced by NCEP-NCARv1 (1981-2017). Fig 4: Left) Number of melt days ( (i.e. when the daily meltwater production > 5 mmWE/day) from the 1 Jun 2017 to 31 Aug 2017. Right) Same as Left) but in respect to the 1981-2010 average from 1 Jun to 31 Aug. 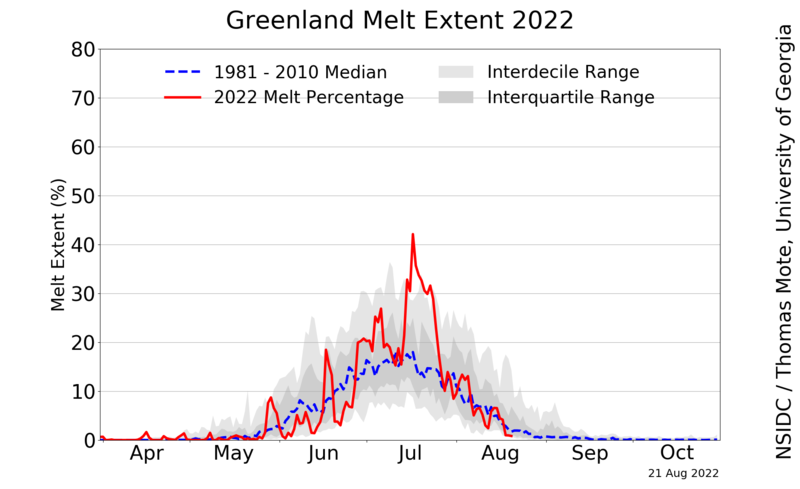 Fig 5: Left) Melt extent as derived from satellite data (Credit: NSIDC/Thomas Mote). Right) Same as a) but as simulated by MARv3.7 forced by NCEP-NCARv1. Daily meltwater production > 5 mmWE/day is used as melt threshold in MARv3.7. Fig 6: Greenland bloking index (GBI) from NCEP-NCARv1 in red and from the Global Forecast System (GFS) based forcasting in dashed red. According to Hanna et al. (2013), the GBI is defined as the 500hPa geopotential height area averaged over 60-80°N, 280-340°E. Fig 7: Idem as Fig. 6 but for 700hPa temperature averaged over 60-80°N, 280-340°E. Fig 8: Left) Anomaly of surface albedo in respect to the 1981-2010 average over the same day. Righ) Anomaly of the JJA mean surface albedo in respect to the 1981-2010 average from 1 Jun to 31 Aug. Fig 9: Same as Fig. 8 but for the near-surface temperature (~3m) as simulated by MARv3.7 forced by NCEP-NCARv1. Fig 10: Same as Fig. 9 but for the incoming shortwave radiation (in W/m²) as simulated by MARv3.7forced by NCEP-NCARv1. 3. MARv3.5.2 outputs over 1900-2100 (ULg). 4. Validation of MARv3.5.2 with PROMICE measurements (ULg). 5. Raw daily MARv3.7 outputs forced by NCEP1. The 2017 files is automatically updated every day.